Archibald Douglas who married Margaret Stewart in 1390 was killed in The Battle of Verneuil, a battle of the Hundred Years' War, fought on 17 August 1424 near Verneuil in Normandy and was a significant English victory. We lost many of our relatives during this battle and at Agincourt also...but we still survive. France had scarcely recovered from the disaster at Agincourt, and most of the northern provinces were in the hands of the English following Henry V's conquest of Normandy. The civil war between the factions of Armagnac and Burgundy showed no sign of ending. The Dauphin was recognised in the south of the country as Charles VII, following the death of his father Charles VI in 1422, but he remained uncrowned. The death of Henry V in the same year as Charles VI brought little relief as the continuing English war effort was effectively managed by John, Duke of Bedford, acting for the infant Henry VI. France desperately needed soldiers, and looked to Scotland, her old ally, to provide essential military aid. The army of ScotlandThe first large contingent of Scots troops came to France in the autumn of 1419, some 6000 men under the command of John Stewart, 2nd Earl of Buchan. These men, supplemented from time-to-time with fresh volunteers, soon became an integral part of the French war effort; and by the summer of 1420 the 'Army of Scotland' was a distinct force in the French royal service. They proved their worth the following year, playing a large part in the victory the Battle of Baugé, the first serious setback experienced by the English. The mood of optimism this engendered collapsed in 1423, when many of Buchan's men fell at the Battle of Cravant. Buchan returnsAt the beginning of 1424 Buchan arrived back, bringing with him a further 6500 men. He was accompanied by Archibald Douglas, 4th Earl of Douglas, arguably the most powerful nobleman in Scotland. On 24 April 1424 the army, comprising 2500 men at arms and 4000 archers, entered the Dauphin's headquarters at Bourges, helping to raise Charles' spirits. March to VerneuilIn August the new army made ready to march into action to relieve the castle of Ivry near Le Mans, under siege by the Duke of Bedford. Douglas (the newly created Duke of Touraine), and Buchan left Tours on 4 August to link with the French commanders, the duke of Alençon and the viscounts of Narbonne and Aumale. But before the army could arrive Ivry surrendered to the English. Uncertain what to do the allied commanders held a council of war. The Scots and some of the younger French officers were eager for battle; but Narbonne and the senior nobility had not forgotten Agincourt, and were reluctant to take the risk. As a compromise it was agreed to attack the English strongholds on the Norman border, beginning with Verneuil in the west. The town was taken by a simple trick: a group of Scots, leading some of their fellow countrymen as prisoners, pretended to be English, and claimed that Bedford had defeated the allies in battle, whereupon the gates were opened. Bedford comesOn 15 August Bedford received news that Verneuil was in French hands and resolved to make his way there as quickly as he could. As he neared the town two days later the Scots persuaded their French comrades to make a stand, Douglas apparently having forgotten the lessons of Homildon Hill. He is said to have received a message from Bedford that he had come to drink with him and prayed for an early meeting. Douglas replied that having failed to find the duke in England he had come to seek him in France. The army then deployed a mile north of Verneuil on an open plain astride the road leading out of the Forest of Piseux. Narbonne and the French division was situated on the left of the road, supported by a wing of French cavalry, while Douglas and Buchan were on the right supported by a similar wing of Lombard cavalry, recruited in northern Italy. Aumale was given overall command; but this heterogeneous army defied all attempts at co-ordinated direction. On emerging from the Forest Bedford drew up his men in two divisions to match the disposition of the enemy, with the usual distribution of men-at-arms in the centre and archers on the wings. He also took the precaution of posting a strong reserve of 2000 archers to the rear to guard the baggage. Bedford commanded the division facing the French, and Thomas Montague, Earl of Salisbury, that facing the Scots. A bloody day. At about 4pm, as if by some pre-arranged signal, the two hosts advanced simultaneously. Once Bedford had taken his troops within arrow range he ordered a halt and the archers started to drive their stakes into the ground, a simple but effective device for snaring cavalry. The ground had been baked hard by the summer sun, and the stakes could be forced in only with difficulty. Seeing an opportunity the French began an immediate charge out of synchrony with the Scots division. 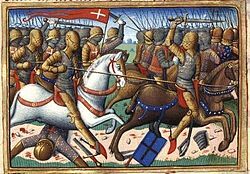 The archers on Bedford's extreme right were caught off balance (the tough armour worn by the Lombards may also have compounded the threat), allowing the French cavalry to break through their ranks, leaving that flank dangerously exposed. The opportunity was lost when the cavalry failed to wheel round. They continued their charge away towards the baggage train to the north, while the men-at-arms in Bedford's division began a spirited attack on the French infantry to their front. Unable to withstand the onslaught, Narbonne's division broke and was chased back to Verneuil, where many, including Aumale, were drowned in the moat. Having disposed of the French, Bedford called a halt to the pursuit and returned to the battlefield, where Salisbury was closely engaged with the Scots, now standing alone. The Lombard cavalry, anxious that their French counterparts were poised to take all the spoils, charged round the English left flank towards the baggage. By the time they arrived the French had been driven off by Bedford's reserve, soon to be followed by the Lombards. Having tasted blood the reserve decided on their own initiative to enter the main battle, advancing on the unsupported Scottish right wing. The Battle of Verneuil reached its closing stages when Bedford returned from the south to take the Scots in the rear. Now almost completely surrounded, the Scots made a ferocious last stand. A high priceVerneuil was one of the bloodiest battles of the Hundred Years War, described by the English as a second Agincourt. Altogether some 6000 allied troops were killed, including 4000 Scots. The English lost 1600 men, an unusually high figure for them, far greater than their losses at Agincourt, indicating the ferocity of the fight. The Earl of Douglas fought on the losing side for the last time, joined in death by the Earl of Buchan. The Army of Scotland had been severely mauled; but it was not yet ready to march out of history. Greatly saddened by the catastrophe at Verneuil, Charles continued to honour the survivors, one of whom, John Carmichael of Douglasdale, the chaplain of the dead Douglas, was created Bishop of Orléans.